When the Jolie-Pitt twins, Knox and Vivienne, were born over a decade ago on 12 July 2008, People magazine paid a mind-blowing $15,000,000 for the first set of exclusive photos. Celebrity photographers (never to be confused with the paparazzi) offer the man on the street an unencumbered glimpse into the lives of the world’s most illustrious celebrities. While some of the world’s most renowned celeb photographers, such as Annie Leibotwitz, prefer to not partake in an abundance of social media activity, others make use of the various platforms, and Instagram in particular, to not only showcase their work but interact with fans as well. Here are just three of countless eminent photographers worth following on Instagram this year. Australian-born Russell James dropped out of school at the age of 14 and got his first job working in a factory that manufactured trash cans. Fast-forward to 2019 and James not only has nearly 900k Instagram followers but has also earned the title as one of the best celeb photographers in the world. Although he is best known for his work with Victoria’s Secret that has been featured in Marie Claire, Vogue, Sports Illustrated, and GQ, James has also appeared on both America’s Next Top Model and Australia’s Next Top Model. With nearly 71k followers on Instagram, Dan Winters is considered to be one of the best celebrity photographers of all times. Not only is he known for his exquisite lighting style but also his ability to draw breath-taking raw emotion out of his subjects. According to industry professionals CanvasPop.com, his spectacular imagery is exactly the kind of timeless art that should not only appear in fashion magazines, but should also be immortalized within interior design. During his career, Winter has photographed a long list of the world’s biggest celebs including the likes of Will Ferrell, Ryan Gosling, Zooey Deschanel, Brad Pitt, and Winona Ryder. Upon visiting his Instagram page you will come across photos of these as well as a multitude of other actors, sports stars, musicians, and even presidential figures. After moving from her hometown in Massachusetts, Peggy Sirota soon found herself taking headshots for her model/actor colleagues at Fred Segal’s in Hollywood. Today, Peggy has over 60k followers on Instagram and is known worldwide for her expressive and somewhat whimsical imagery that reveals a great deal about her subjects. Regarded as one of the most prolific celeb photographers in the world at present, Peggy has photographed a vast selection of international celebs including Madonna, 50 Cent, Kobe Bryant, Charlize Theron, Natalie Portman, and even His Holiness The 14th Dalai Lama. She has worked on highly-successful ad campaigns for the likes of Nike, Burberry, Revlon, Maybelline, and Volvo and has had her work featured in GQ, Vogue, Rolling Stone, Vanity Fair, and Esquire, among others. Without the presence of celeb photographers, the Average Joe would be blissfully unaware of a lot of the doings of the world’s most famous celebrities. Thankfully, Instagram has made it easier than ever before to keep abreast of the latest in celebrity photographs by simply ’following’ some of the hottest photographers in the world. Supposing you happen to reside in a state that permits the use of marijuana and its products for recreation or medicinal use, consider purchasing at a weed dispensary. A cannabis dispensary is a local, government-regulated retail outlet where you can buy marijuana and marijuana-related products legally. Despite the legalization and availability of weed stores, some people still resort to sourcing their marijuana from street peddlers which can be dangerous. Consequently, we’ve chosen to highlight a few of the perks to obtaining your marijuana from a licensed dealer. At times, your dealer might lack your preferred weed product or strain depending on your medical condition. In such cases, most people panic and resort to employing unorthodox means to obtain their medication. The experience is potentially daunting and anxiety-inducing owing to the fear of possible arrest, which is enough to aggravate some conditions. Contrary, marijuana dispensaries offer a safe hub for obtaining any strain of marijuana under one roof without worrying about breaking the law. The dispensaries support regulated medical marijuana programs by offering safe and legal cannabis access environment to promote responsible behavior amongst both users and suppliers. Marijuana dispensaries help patients make informed decisions in matters pertaining drug use. Additionally, these dispensaries help people to use marijuana in a manner that’s consistent with their individual needs. Obtaining marijuana from a dispensary affords users the opportunity to forge a close relationship with the facility’s attendant. In such cases, users obtain insights and guidance unavailable when consulting street peddlers. The attendants in a weed dispensary make you feel relaxed and encourage the sharing of your health goals and experiences. Upon understanding your condition based on the information that you share, an attendant can recommend a particular marijuana strain with a precise dosage to help you achieve the desired results. With such science-based guidance, your chances of abusing or overlying on the drug are minimized. It’s hard to ascertain the quality of marijuana you purchase from unlicensed dealers like street peddlers — for instance, many times you hear of cases where cannabis products sold by dealers contained toxic substances like pesticide and fertilizer. On the other hand, all the cannabis products that are sold at cannabis dispensaries are thoroughly tested in a laboratory environment before releasing to the market. Therefore, whatever is indicated on the packaging of a marijuana product in a cannabis dispensary is the actual components of the product; nothing more, nothing less. If you want to get marijuana product easily and use it without any worry, get it from a licensed weed dispensary. A weed dispensary allows you to seek services at your convenience. You’ll face challenges when purchasing your weed from peddlers who may periodically lack products. Most importantly, marijuana dispensaries offer competitive pricing. Illumination Entertainment really has a gold mine here with the “Despicable Me” franchise. It literally just prints its own money…but so far after three films and an even better spin-off, they are still great. Pixar’s movies cost near or above $200 million per film and don’t get me wrong they are good, at least they used to be, while Illumination knocks out films like this and “The Secret Lives of Pets” for just $80 million. These are quality films that are very entertaining, pack great voice casts and overall great movies. “Despicable Me 3” is a great addition to the series and is a step up from the second film. Official Premise: The mischievous Minions hope that Gru will return to a life of crime after the new boss of the Anti-Villain League fires him. 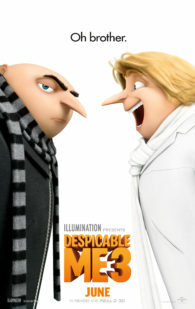 Instead, Gru decides to remain retired and travel to Freedonia to meet his long-lost twin brother for the first time. The reunited siblings soon find themselves in an uneasy alliance to take down the elusive Balthazar Bratt, a former 1980s child star who seeks revenge against the world. Pharrell Williams steps up again and some great new songs for this film. I don’t think he replicated another “Happy” on this soundtrack but very fun music. In addition the film has a flood of 80’s theme of music that is very fun in this film ranging from a-ha to Madonna to Michael Jackson. Trey Parker, co-creator of “South Park” is a new addition to this cast and voices the role of villain Balthazar Bratt, a former child star who’s grown up to become obsessed with the character he played in the 80’s, Evil Bratt. Trey knocks it out of the park and steals the movie, no question. Also we get to meet Gru’s twin brother, Dru and he is another great addition to this sequel. What I love most about this film is that it is has a nice balance. A nice balance of Gru, Lucy and the girls as well as the a fun backstory for Bratt and of course we get a good amount of those lovable Minions. If Illumination is reading, I am ready for a “Minions 2” BTW for sure next. Just love those guys (or whatever they are). I saw this with my five year old daughter and she simply had a blast. She was laughing throughout and even though some of the 80’s theme was obviously lost on her she enjoyed the balance of the characters and just had a great time watching this film. I really hope that Illumination continues down this trend and continues to deliver great animated films for the whole family! 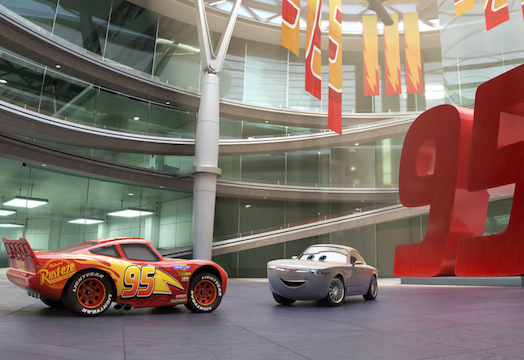 After the second disaster of a film, the “Cars” franchise should have come to an end. The thing is that the “Cars” brand brings in billions in merchandise alone, so Disney is stupid not to keep the brand in people’s heads. Personally, I have never been a fan of either of the two previous films. The first was good, don’t get me wrong but it’s not a favorite when I think of great Pixar films. “Cars 3”, luckily, was better than the second that’s for sure. The film has more heart like the first but unfortunately doesn’t deliver much till the end. Newcomer character, Cruz Ramierz definitely steals the show. Official Premise: Blindsided by a new generation of blazing-fast racers, the legendary Lightning McQueen (voice of Owen Wilson) is suddenly pushed out of the sport he loves. To get back in the game, he will need the help of an eager young race technician, Cruz Ramirez (voice of Cristela Alonzo), with her own plan to win, plus inspiration from the late Fabulous Hudson Hornet and a few unexpected turns. Proving that #95 isn’t through yet will test the heart of a champion on Piston Cup Racing’s biggest stage! Before I saw this I was quick to say at least Mater looks like he is not even in this film but what’s funny after seeing it is his scenes I actually enjoyed and added the only real comedic relief. He still was only in the film for a very short time. I took my five year old to see this and honestly, she was bored out of her mind and gave it a big thumbs down. I liked it a little more because of the heart that the film tried to replicate from the first film. I appreciated that and I know others will as well. Keeping in line with the previous films, Pixar didn’t disappoint. The visuals were impressive and the colors were beautiful, no question. The 3D, I felt was rather useless. I don’t recall being wowed by anything. Obviously, I doubt we have seen the end of this franchise. I did like the way it was ended in particular and could lead it down an interesting path, but overall I just left the theatre like my kid feeling kinda blah, didn’t hate it just didn’t really love it. Silicon Valley – a land of big ideas and bigger egos. To celebrate the Digital HD release of SILICON VALLEY: THE COMPLETE THIRD SEASON”, Media Mikes would like to give our fans a chance to win a Digital HD code for the season. If you want to win this great prize, please leave a comment below with your favorite character from the show. This giveaway will remain open until August 20th at Noon, Eastern Time. This is open to our readers in US only. One entry per person, per household. All other entries will be considered invalid. Media Mikes will randomly select winners. Winners will be alerted via email. The Emmys® love the Valley! The latest season of the Silicon Valley was nominated for 11 Emmy Awards® including Outstanding Comedy Series, Outstanding Lead Actor (Thomas Middleditch), Outstanding Directing for a Comedy Series (Alec Berg, Mike Judge) and Outstanding Writing for a Comedy Series (Alec Berg, Dan O’Keefe). Catch up on July 25, 2016 when Silicon Valley: The Complete Third Season debuts on Digital HD on (season pass currently available). After last season’s shocking ending, which found Pied Piper celebrating legal victory just as Richard (Thomas Middleditch) was ousted as CEO, Season 3 picks up where we left off, with Richard offered the diminished role of CTO and the rest of his team – Erlich (T.J. Miller), Jared (Zach Woods), Dinesh (Kumail Nanjiani) and Gilfoyle (Martin Starr) – facing the question of just how far their loyalty extends. With a new no-nonsense CEO hell-bent on transforming everything from Pied Piper’s offices to its business agenda, the guys must find a way to triumph in the war of Art vs. Commerce, maneuvering the many competing interests along the way. Meanwhile, as Gavin Belson (Matt Ross) works to rehabilitate Hooli’s image following his blunders, Big Head (Josh Brener) finds himself in a new partnership, while at Raviga, Laurie (Suzanne Cryer) holds her cards close to the vest, as Monica (Amanda Crew) tries to look out for Pied Piper’s best interests. With its patented brand of silly and satirical humor, this season of Silicon Valley continues to probe the ripe-for-comedy world of tech, as our heroes grow bolder, if not always wiser. You shouldn’t miss the series that has been hailed as “Triumphantly funny… jokes hit with blade-like precision” (The Hollywood Reporter) and “…nails both palpable tension and biting humor” (Entertainment Weekly). The full season download of Silicon Valley: The Complete Third Season on Digital HD at iTunes, Google, Vudu and Sony comes with a series recap, the trailer and Deleted Scenes. You may not know Al Sapienza by name but you surely know his face. Probably best known as Mikey Palmice on “The Sopranos,” Sapienza has appeared in over 200 films and television programs. On the big screen he’s been seen in films like “Pretty Woman,” “Free Willy 2” and “Lethal Weapon 4” while on television he’s co-starred on such programs as “Law and Order,” “NYPD Blue” and “Blue Bloods.” He has also appeared in both the 1998 and 2014 versions of “Godzilla” This week Mr. Sapienza can be seen alongside Liam Neeson in “Taken 3.” To help promote this appearance Mr. Sapienza took time out to talk to me about what he does and why he does it. Al Sapienza: Where are you calling from? AS: Kansas City? I love Kansas City. I played the Uptown Theater there. I had some great times in Kansas City. AS: I’m one of those actors who loves to work. I love to work. And I don’t look at work as “work.” I honestly don’t. When I’m working I’m not working. I’m working when I’m not working! It’s fun being creative…being around creative people. Even though I’ve been an actor for 30 years I’m also a fan. I love it. I love movies…I love TV…I love the theater. Before I went on the audition I watched the original “Taken.” To be honest I hadn’t seen it but since I had the audition for “Taken 3” I watched it and I really liked it. Then I watched “Taken 2.” I’m a tremendous fan of Liam Neeson. I think he’s incredible in everything he does. He throws himself into every part he does. And now I finally have the chance to work with him. And it turns out that he’s just a real regular and good guy. Plus it’s a big movie…it’s a big franchise with a big following. MS: You’ve appeared in other sequels. Is it difficult going into a project like that…one that might have an already established cast and crew? AS: It’s funny. It’s all the same. If you’re acting correctly…if your just totally in the moment…if you’ve created this fake reality in your imagination and in your mind and just be real yourself…on the acting standpoint it doesn’t matter if it’s a sequel or a one shot deal. You shoot to do a great job all the time. And to me, that’s what is cool about acting! MS: You’ve done a lot of both film and television. Do you have a preference? AS: Good question. The only difference to me is that it’s a longer process on a film. You have more time to be creative…they have more time to shoot. Sometimes for a movie that’s an hour and a half you shoot for seven weeks where on a television show that’s an hour long you shoot for eight days. TV really gets your adrenaline going…it really makes you feel good about yourself. When you get to the set and six in the morning you better know your lines…and everybody else’s lines. TV is really more demanding, because you have to be ready to just knock it out where on a film you have more time. What I’m really excited about is cable television. I think that the movies are moving towards being corporate franchises…Batman, Spider-man, Transformers. They keep trying to do this multi-million dollar franchises with all of the marketing and promotions. I think cable television is going to continue to be cutting edge. MS: Speaking of multi-million dollar movies, you have the rare distinction of having appeared in both 1998’s “Godzilla” as well as this past year’s version. Do you have a favorite? AS: That’s a tough one. The director of this past “Godzilla” (Gareth Edwards) had done a great film called “Monsters.” He did it on an incredibly small budget, doing all of the special effects himself on his laptop. I really enjoyed working with him, he was such a special guy. I also enjoyed the earlier one, working with Roland Emerich and Dean Devlin. But I think I enjoy Gareth’s film better because I think he tried to be more like the old, classic films…more about science and science fiction. MS: Normally I’d ask what your next project would be, but if the Internet Movie Data Base is to be believed you have no less than 22 projects between now and next year. So I guess I’ll ask what you do in your spare time? AS: (laughs) Spare time? I’m an actor, I don’t need spare time. I like to play football on Saturday mornings. There is a long running game played in New York that has been going on since 1964. They play every week, be it snow or rain. As for what is next, I’m very excited about a mini-series running now called “Ascension,” which will be shown on the SyFy Channel. It’s a very, very interesting show with a very, very interesting concept. That’s what I’m really excited about at the moment.